President Obama wants expanded broadband, as indicated in his State of the Union address—a laudable goal. But what to use it for, beyond such purposes as, say, the faster downloading of YouTubes? Here’s the latest version of LibraryCity’s call for a national digital library endowment and intertwined public and academic library systems online. Short of time? Read an executive summary. – D.R. The average 15-to-19-year-old in the U.S. spends only six minutes a day reading for fun, according to the Bureau of Labor Statistics. What’s more, a just-released report from Scholastic, discussed later in this commentary, warns that the number of young pleasure-readers has dropped dramatically since 2010. A national digital library endowment, strong on encouragement of recreational reading, among many other strengths, could help turn things around. It could also sharpen young people’s technical and creative skills. The all-digital BiblioTech—the San Antonio-area library shown in a must-watch video tour, narrated by a gifted teenager named Mariah Espinosa—illustrates the possibilities. No, the $15-$20 billion digital endowment and related efforts would not substitute for much-needed initiatives in areas such as early childhood education or poverty-fighting. But they would complement them, as reducers of inequities of knowledge, class, wealth and income, and also as general enablers of economic progress over the long term. Americans would be able to download thousands and thousands of e-books and other items directly from national collections regardless of how stingy or cash-strapped their own localities were. The strategy here would be not to replace local libraries but to help them survive and in fact flourish in a digital era. More money could also be available for, say, the hiring of well-prepared school librarians and public librarians in the very highest-poverty areas, including the hills and hamlets of predominantly white Appalachia. Especially helpful, too, would be scholarships and other assistance for African-Americans, Hispanics and other members of minorities to become librarians and serve as book-and-tech-hip role models for at-risk young people. In staffing and content, the library and publishing worlds are diversity disasters regardless of the well-intentioned efforts of the American Library Association and publishers. Of 118,866 credentialed librarians in a 2009-2010 study, just 563 were African-American males and only 522 were Latino men. More female librarians from minority groups, of course, would also be helpful even though the most dire need is for males. Other statistics show how ill-prepared we are for the era when non-Hispanic whites will be a minority. Among 5,000 studied books published in 2013 for children and teens, a mere 68 were by black writers and only 93 were about African-Americans, according to the Cooperative Children’s Book Center at the University of Wisconsin. The “by” and “about” figure for Hispanics were, respectively, 48 and 57. Funded by interested members of the super rich, the endowment would not replace tax support for libraries of various kinds, but rather augment it. The endowment could even offer matching grants in some instances to promote greater local and state tax support, as well as other donations directly to the institutions. To discourage certain shortsighted states and localities from simply reducing their own spending in areas where the endowment was helping, an adjunct “Friends” group could mount a sustained media campaign to keep the benefits of libraries and reading on voters’ minds. The endowment would not just pay for activities related to traditional literacy—it could also help students develop multimedia skills, for example. Still, the major focus would be on reading and knowledge. In fact, the endowment also could help pay for certain kinds of paper books, such as those used by low-income parents reading to children. The real future, however, is digital for reasons I’ll explain in detail here. OverDrive, the largest supplier of e-books for U.S. public libraries and schools, says that “circulation of eBooks, audiobooks and other digital media increased 33% in 2014 to 137 million checkouts.” Try checking out a bestselling e-book in certain well-off cities like my hometown of Alexandria, Virginia. Chances are, someone else has beaten you to it. You may have to wait weeks or even months. The problem is that so many of the people who need the library books the most are not in the electronic queues. Furthermore, even well-educated Americans tend to be ignorant of the optimal ways of enjoying e-books, whether the issue is software adjustments for individual needs or the selection of e-reading apps and devices; and that’s another issue that endowment-funded librarians could help address. The encouragement of vendors to care more about e-book usability—Amazon has actually discontinued the availability of text to speech in E Ink Kindles despite the tiny cost of the technology—also would be good. Greater purchasing clout by libraries could effect many positive changes within the industry in this respect. Even if reinvented libraries helped in merely a tiny way to increase Americans’ cognitive powers, the financial rewards could be still be worthwhile if we extrapolate from a 2010 paper by Eric A. Hanushek at Stanford and Ludger Woessmann of the University of Munich, both economists. Just a 25-point rise in PISA scores by 2030 might boost our Gross Domestic Product by more than $40 trillion over the lives of children born in the year of the study. What’s more, keep in mind the benefits of the right books in noncognitive areas, such as character development. Alas, U.S. public libraries can now spend only about $4 per capita on content of all kinds. Well-targeted support of U.S. libraries in the digital era would enhance America’ global competitiveness. Digital library projects exist in dozens of countries. But they lack the resources that a national digital endowment here in the United States could offer. That may change. Russia, for example, is getting more serious about digital libraries and will be launching a national one later this year. In the U.S., however, many policymakers have yet to understand the full possibilities of e-libraries—whether as workforce-upgraders or simply improvers of the average person’s quality of life. The noncommercial digital library projects here tend to be academic or for special users such as people with disabilities, and even academics and the disabled are not served as well as they could be. Furthermore, we need both commercial and noncommercial models. Google Books, OverDrive, and the rest are no substitute for a full-strength national digital library initiative with due attention to K-12 needs and others, as well as a robust infrastructure able to withstand cyber-attacks from those at war with American culture and values. The initiative could not only help libraries here but also in other countries, through content exchanges and security advice. In fact, pubic domain and Creative Commons items should be accessible globally (it’s already happening to a limited extent with cultural and historical materials through the Library of Congress’s World Digital Library exchange and other efforts). Along the way, a fully funded endowment could be a major boost for the U.S publishing industry, not just in terms of library purchases but in terms of the promotion of reading in a era when so many bookstores have closed and when the typical drugstore book rack no longer carries works by major literary novelists. Links from library catalogs could go not just to Amazon and other big chains but to near-by neighborhood bookstores. Money for an endowment is there. Only 400 U.S. billionaires are together worth more than two trillion dollars, with assets exceeding those of the bottom half of Americans. Just a tiny speck of the billionaires’ combined wealth could go a long way, dovetailing nicely with the Gates Giving Pledge, which globally has inspired more than $500 billion in commitments. Current public library endowments total only several billon, a mere fraction of the libraries’ operating expenses, of which a pitiful $1.2 billion is for books and other items. The initial goal here might be an endowment of $15-$20 billion within five years. Such a number is realistic. The more donors, the better, but if need be, money could come from just a tiny percentage of the Forbes 400. Even when Warren Buffett solicits fellow billionaires for the Giving Pledge initiative, not everyone obliges. But enough do to make the pledge worthwhile just the same, and encouragement from the Oval Office could help the endowment immeasurably. President Obama has already taken a few steps into this territory; his White House held a summit for the young and super rich. Rather than just inspiring billionaires and future billionaires to go their separate ways with individual projects, however, why not also urge them to think about pooling resources in a national digital library endowment? Here is a chance to exercise Presidential leadership regardless of all the gridlock and Obama-hating on Capitol Hill. The proposed endowment could honor the rich as donors and advisors but be run by professionals accountable to the public. For maximum experimentation and to avoid the need for the blessing of the budget hawks on the Hill, the endowment could start as an NGO. But as I personally see it, the organization ultimately should evolve into a public agency for transparency and responsiveness to mass needs, one way to address concerns that the unelected foundation establishment already exercises too much influence. In business terms, the return on investments would be more impressive if we sought not to create just readers, but rather lifelong readers. Among other activities, the endowment could promote recreational reading of the kind that most helped students and others. 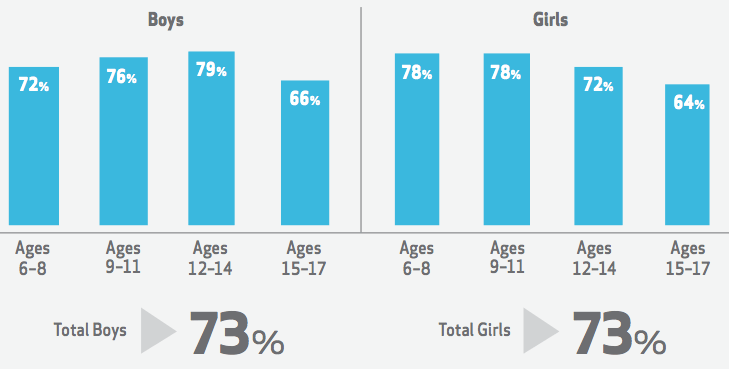 Seventy-three percent of surveyed children ages 6-17 say they would read more if they found more books they enjoyed, the report from Scholastic says, and 90 percent say they are more likely to finish reading books they selected themselves—a powerful argument for expanding library collections of good books to appeal to individual interests. The real issue is not digital vs. paper despite the efficiencies of the former. It’s the number and kinds of books and the availability of resources to encourage their absorption and enjoyment, including the fostering of family literacy. 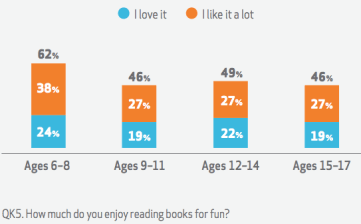 Sadly, the Scholastic-commissioned research found a nine percent decline between 2010 and 2014 in the number of 6-17-year-olds who said they either “love” reading or “like it a lot.” Sixty percent did in 2010, only 51 percent in 2014. What’s more, as indicated by the chart below, Scholastic found that “reading enjoyment declines sharply after age 8.” One explanation was competition from cell phones and other screen-related activities—a reason for libraries to start digital-era book clubs that would not only help parents and children discover the right books, but also address technological issues, teaching mothers and fathers, for example, to gain greater control over their kids’ cell phone habits and other computer usage. Screens themselves are not evil. Rather, let’s consider what they display—a junky YouTube or a digital edition of The Adventures of Huckleberry Finn. How to respond in other ways to the declines in reading for fun? Increasing access to books would help. So would more reading time in school—especially for disadvantaged children—and family literacy. “Our research shows that providing encouragement and time both in school and at home for children of all ages to enjoy books they choose to read will help them discover the power and joy of reading,” Scholastic’s chief academic officer Francie Alexander has said. “These tactics will also help to motivate kids to read more books, which will improve their skills and open a world of possibilities for them in the future.” Scholastic identified parent-to-child-reading as a major promoter of literacy among the young, but discouragingly, many parents stop reading aloud to their children before the young people themselves want it to end. 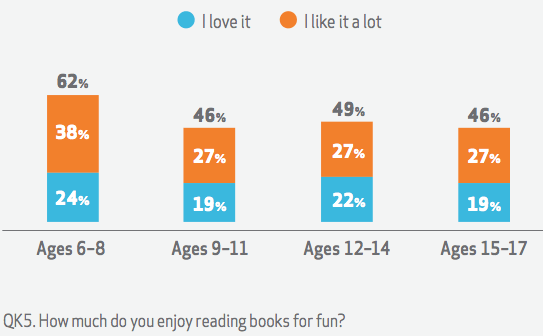 Forty-eight percent of children 6-8 do not want the read-alouds to end, and 34 percent of the kids 8-11 don’t. The rewards from a serious recreational reading initiative would be substantial. According to recent U.K. research and other studies described here, reading for fun can be a powerful booster of cognitive powers and test scores among other benefits. The future workforce could come out ahead, long term, especially when so many new jobs will require analytical, self-motivated people with good communications skills and empathy. Along the way, the endowment could help public libraries reinvent family literacy so that parents became better role models and more stimulating conversationalists for young recreational readers. And it could foster other change. Updated for the digital era, old activities such as book clubs could draw new kinds of patrons from minority, immigrant, and rural communities and better serve existing library users. Furthermore, beyond the K-12 benefits already mentioned, indirect ones could accrue in the form of reduced costs of nursing home stays, medical care, and even imprisonment and crime prevention (this essay will offer specifics on all those fronts). Other economic and social gains also would occur. Wooed by a rural Colorado community recently, doctors inquired not about local golfing but about the caliber of the local library. LibraryCity Contributor Jim Duncan, executive director of the Colorado Library Consortium, sees major value in an endowment to help enrich the collections and services of state and local libraries. As I’ll document, benefits could also exist in another area, too—post-Ferguson race relations, the improvement of which is not only desirable morally but also economically. For now, we are missing out on the full potential of libraries as pedagogical tools, a use jibing with past studies showing that students fare better with good school libraries. The endowment concept ties in well with some important goals of the Common Core initiative (for example, the strengthening of cross-curricular efforts, the encouragement of critical thinking and the development of research skills useful in both school and life). Top policymakers are not the only ones failing to fully see the K-12- and workforce-related possibilities here. So are many librarians themselves. Today’s librarians want to be about more than books, offering everything from 3D printing to loans of fishing rods while continuing their institutions’ essential roles as community hubs and homework havens. In fact, with sufficient resources, there is no need for this to be “either or.” The more happening at libraries, including stimulating video games, the more likely young people will encounter books while improving themselves in other ways. Libraries should help receptive students acquire nonbook skills in pursuits ranging from music to art appreciation to creation of multimedia, and they should also help connect like-minded people and serve as civic and recreational centers. What’s more, public libraries should offer comprehensive electronic information services and otherwise serve people’s reference needs, especially on family-, health-, job- and financially related matters. But books and related activities should still be libraries’ main calling card in an era when TV, spectator sports, and video games played elsewhere claim so much of young people’s time. Rather than pandering to trendies who dislike libraries serving as “book warehouses,” even the digital kind, library leaders and policymakers should consider the equality gap and actual needs. Pew research says books and other collection items are among the top reasons why Americans go to the library in the first place, especially low-income people and members of minorities. DVDs probably attract more than a few patrons, Netflix and other streaming services notwithstanding. But then how about the eagerness of many parents, especially immigrants, to see their children do better? That means exposure to good books and other texts, not just DVDs and the like, and it is all the more reason for American libraries to regain their old sense of purpose. An abundance of engaging titles matching patrons’ interests and needs would be in line with the second of the Five Laws of Library Science, S. R. Ranganathan’s key precepts for the profession: “Every reader his [or her] book.” Keep in mind the potential of popular-level books as gateways to more advanced ones (as well as the usefulness of librarians trained to encourage such literary journeys). For libraries to honor the law’s spirit, readers need plenty of both kinds of books. The typical U.S. library devotes just 12 percent of its budget to books and other materials, compared to about 25 percent in the early 1940s. Meanwhile, in cash-strapped urban areas and in impoverished communities in the Deep South and elsewhere, libraries are underspending because the money is not there in the first place—not just for the actual books but also for enough professionals to promote the books’ discovery, absorption and enjoyment. A national digital library endowment could help address these “savage inequalities” and introduce new e-based efficiencies to increase the percentages of the budgets devoted to books and other content. But what about other justifications for such an endowment? I can think of civic-related arguments—for example, the greater ability of book readers to understand news accounts and vote more intelligently. But let us focus here on the K-12 and economic cases. Experts have long said that reading boosts cognitive skills and academic achievement in general; reading is a scaffolding and gateway for the acquisition of other skills and knowledge. Warwick B. Elley, a New Zealand researcher, confirmed the special value of regular reading in the 1990s after analyzing the aggregated test scores of 200,000 students in 32 countries. “The availability of books,” he wrote in a study for the International Association for the Evaluation of Educational Achievement, “is a key factor in reading literacy. The higher-scoring countries typically provide their students with greater access to books in the home, in nearby community libraries and book stores, and in school.” In fact, the study concluded that book availability was more crucial for nine-year-olds than such factors as past pre-school attendance or smaller classes. Not to criticize preschool and the rest, which provide benefits far beyond literacy. But policymakers need to review academic research to understand better the pedagogical benefits of book-rich libraries, too (as well as other approaches that the study validates—for example, “frequent silent reading in class”). More recently, an analysis of 6,000 persons’ test scores by the Institute of Education at the University of London further cemented the case for boosting the number of books in young people’s lives, especially for pleasure reading. “The combined effect on children’s progress of reading books often, going to the library regularly and reading newspapers at 16 was four times greater than the advantage children gained from having a parent with a degree,” the institute said in summing up findings by Dr. Alice Sullivan and her colleague Matt Brown. Reading even helped improve math skills. And significantly the study focused on pleasure reading, rather than simply the usual school variety. The researchers also determined, in keeping with a basic precepts of family literacy, that well-read parents tended to produce better-read children. No, this isn’t always true; even the most literate and gung-ho librarians can be the mothers and fathers of reluctant readers. But as a rule, it applies. Want to raise reading standards and upgrade the workforce? Then, if we extrapolate from the Sullivan-Brown findings, we should worry about public libraries, not just school libraries and the usual classroom instruction. As readers or aspiring readers, parents will show more interest in public library offerings than those from school libraries. If nothing else, remember that public libraries are more likely than schools to be settings for adult literacy programs, even though the endowment should help both kinds of libraries. What’s more, in a 2014 follow-up on their original reading-for-fun study, Sullivan and Brown found that regular pleasure readers tested at ages 10 and 16 enjoyed significantly larger vocabularies in middle age. The once-10-year-olds scored 67 percent on a vocabulary test at age 42, or 16 points ahead of other subjects. A stunning nine-point gap still existed even when Sullivan and Brown factored in socioeconomic variables. Also, they found that “high-brow” novels were especially useful in expanding vocabularies—the very kind of title that libraries are far more likely to push than Amazon. Vocabulary is far from the only determinant in the absorption of text, but it is a key one. That said, many authorities would warn against libraries focusing just on literary works. Libraries should gently nudge people toward more demanding materials, but offer and promote the reading of all kinds of books, fiction and nonfiction, highbrow and lowbrow. Kelly Gallagher, author of Readicide: How Schools Are Killing Reading and What You Can Do About It, warns that “when academic reading is the only kind of reading put on our students’ plates, readicide occurs. As much as I love Dickens and Shakespeare, I would turn off to reading if I didn’t have a balanced reading diet that included Scott Turow or Michael Connelly.” And for libraries, that means enough money for modern, copyrighted books of both merit and popular appeal, whether or not they are genre works. We mustn’t do physical or digital libraries on the cheap, especially in regard to their collections, and the endowment could go a long way toward ending the content crisis. At the individual level, the payoffs from this strategy could be lifelong. Sullivan and Brown cited a British Medical Journal article and other research suggesting that stronger readers would suffer less mental decline in old age. Potential dollars savings are hard to quantify, but they might run well into the billions over the years, since dementia costs the U.S. as much as $215 billion annually, as reported in the New England Journal of Medicine. To at least some extent—no panacea here—difficult books could in many cases be to dementia what fluoride is to tooth decay. With better reading skills and more mental acumen in general, older people and others would be more likely to follow doctor’s orders, in regard to prescription taking and otherwise. That, in turn, would increase the effectiveness of treatments and reduce costs. Even a small reduction in older Americans’ general mental decline—let’s assume out of caution that reading can do only so much—would save billions. Significantly, if Bal and Veltkamp are correct and we extrapolate, some Truman Capote-style nonfiction like In Cold Blood may actually break the rules through use of narrative that “transports” the reader into the world of the characters. That has implications for library budgets. The best narrative-based nonfiction may require extensive research, often creating additional costs that could result in bigger author-advances and at least somewhat higher book prices. The empathy-related benefits could still be worth the extra costs to libraries, within reason. Remember, too, that good fiction of many kinds can build empathy. We can hardly shrug off The Yiddish Policemen’s Union—Michael Cabon’s mix of alternative history and a detective story—as a genre work incapable of promoting it. Bal and Veltkamp themselves tested the first part of a Sherlock Holmes story on their subjects. They found it to be beneficial even though many critics would say that Arthur Conan Doyle’s writings are respectable but not high literature. Economically and otherwise, what might an increase in empathy mean to society at large? Future practitioners of many professions and trades could do their jobs better if more empathetic, and let’s look beyond the obvious suspects such as doctors, writers, and the clergy. Executives and managers could more easily get inside the heads of the people under them and better grasp their needs. Whether they went ahead and met these needs is another story. But at least they would be more in touch with their workforces and potentially achieve greater productivity than at present. Similarly marketers and other corporate types could better understand the people they hoped to convince to buy products or services. That, in turn, would result in increased consumption—and more jobs. Even at low levels, workers would be more effective through greater empathy. Sales people could better understand customers, and team members in factories could better relate to each other. In cold financial terms, the above are not the only potential benefits of a national digital library system that would help local libraries promote more reading of empathy-building fiction and offer a greater selection of titles matching individual tastes. The costs of our criminal justice system would also go down. More empathetic people are less likely to commit or repeat crimes. In a study published in The Journal of Offender Rehabilitation, researchers C. Roger Jarjoura and Susan Krumholz said only 19 percent of participants in a Changing Lives Through Literature program were reconvicted compared to 45 percent in the control group. Who’s to say the results would be as dramatic on a mass scale? But even a tiny reduction in incarceration rates would save billions of dollars. The best time to reach the people at risk, of course, would be through school and public libraries before they committed their possible offenses. Here is one more argument for the digital endowment—to expand the number of library books easily available everywhere, and help local libraries encourage absorption of the literary and other empathy-promoting titles, including new ones of special interest to the growing percentage of Americans who are members of minorities. Related bonuses of increased empathy would be fewer racial and ethnic hate crimes and more understanding in general, as well a reduction of the economic costs of discrimination. Imagine if the equivalent of Changing Lives Through Literature had been part of the education of both Michael Brown and Darren Wilson, the white police officer in Ferguson, Missouri, who shot the young African-American, thereby provoking a major round of racial incidents, aggravated by the police killing of a 12-year old in Cleveland who was playing with his pellet gun. A chillingly apropos study appeared recently in The Journal of Personality and Social Psychology. The researchers concluded that police are more likely to see black children as older, more prone to violence, and deserving of harsher treatment than whites the same age. Perhaps some preemptive CLTL-style bibliotherapy for all police officers on the beat, not just video-cams carried on the job, should become part of the American law enforcement scene in response to the Ferguson and Cleveland outrages. Within the areas of race and crime and poverty, so much is interrelated. The Sentencing Project, a judicial reform group, estimates that one in three African-American males will go to jail during his lifetime. And suffering unemployment due to discrimination, not just low-education levels, can leave people with fewer legal alternatives to criminal activity. What if those imprisoned could be in school or at work instead and feel more connected to society at large? Enticingly well-stocked libraries and properly prepared librarians are one way to reach out to them while building empathy among people of all races and reducing discrimination. Among many other promoters of reading, endowment money could help libraries start cell phone book clubs, as I call them—to help serve and appeal to a new kind of library patron, especially in the African-American and Hispanic communities. With encouragement and resources from libraries, young people on their own could also found such clubs. Libraries and clubs could especially could promote awareness of books , such as through wall posters at schools and in public places. The current library book clubs work fine for library patrons from the middle and upper middle classes, especially women who like New York Times best sellers or romance or literary novels. But many library-created clubs are underserving people outside the customary demographics, whether through the scheduling of club meetings, failure to market the clubs well, or selection of titles (just how many library book club choices are about sports?). Nor do most libraries deal with the extent to which cell phones are becoming major media consumption devices among many young people who are poor or are African-Americans, Hispanics or members of other racial or ethnic minorities. This trend will only pick up as equipment prices drop and screens, like the ones on Apple phones, grow sharper and larger. Even now, book-capable phones sell discounted for as little as $20 on Amazon—a fraction of what the equivalent technology cost five or ten years ago. The very most cash-strapped students can avoid subscribing to a phone service and rely simply on WiFi at libraries, businesses and elsewhere. Via a club approach, they could enjoy the technical help to get their cheapie gadgets going. Members could receive cell phone and e-book technology tips and learn about other tech, not just discuss the books themselves. The clubs also could position themselves as social organizations, serve food, invite authors and other speakers to come in person or appear via video though services like Skype and Google+ Hangouts, show book-related movies, and when appropriate strive for a family- and neighborhood-oriented approach. While hooking members on popular books, the cubs could encourage them to move on to more challenging titles when they were ready. Moreover, they could nudge members to use books to find out more about the industries of prospective employers or refine their job-hunting techniques. Invited speakers could also provide job-related information directly and, along the way, as role models, talk up books. Online videos and message boards could augment the clubs’ in-person activities—no small detail for time-pressed people juggling around more than one job to try to stay ahead of debt collectors. Additional club-related thoughts are on the LibraryCity site, including an essay by Bertel King, an African-American novelist from rural Virginia, with Web links to club mentions elsewhere. An overview of the cell phone book club concept is here. Yes, in this and other ways, ranging from e-book-era professional development to access-related issues such as WiFi to the preservation of local history, the endowment would focus mainly on digital matters. But it would hardly neglect paper ones or discourage the reading of books in the traditional format. People, for example, could still bring paper books to in-person meetings of cell phone book-clubs (even though the clubs could use “cell phone” in their names to play up the phones’ ability to let readers enjoy books everywhere). And then there is the issue of parent-child reading, the ultimate social medium. E-books in such situations are better than no books. But a colorful picture book of paper and cardboard holds a certain appeal here, and, in fact, we should give out free paper books to low-income mothers, in pediatricians’ offices and elsewhere, along with strong encouragement to read to their offspring. Some studies have suggested that paper books are better for the very youngest readers, who, among other things, enjoy the tactile sensation of turning pages. And paper editions of the right graphic novels might be one way to hook teenage readers. Furthermore, in localities such as Tulare County, California, library systems have experimented with book vending machines. And Columbus, Ohio, has loaded school busses with paper library books for students to read going to and from school. Beyond that, keep in mind the value of paper for art books. Long term, however, digital should be the main show for library patrons at large. We are not just talking here about digital’s efficiencies, its interactivity and ease of updating, or the ability of library e-books to self-expire, eliminating the fear of low-income patrons that they will forget to return their books and incur fines. Consider the ever-improving quality of e-book displays and the growing number of digital natives, as well as older people accustomed to reading off computer screens. My wife and sister and I are baby boomers who prefer e-books to paper books since we can vary font sizes and otherwise modify the view. Frustratingly, though, many people still lack basic “e-book literacy” even if they own devices or use an apps. The knowledgeable do not just change font sizes. The e-book literate also can resort to other strategies. With decent e-book software, they can vary the typeface and the style and weight of the font as well as the space between lines and the margin width. Furthermore, how about different colors combinations of text and background, or experimentation with different margin widths? When software allows, the knowledgeable can boldface all text to increase perceived contrast and enable screens to be dimmer and easier on the eyes and batteries. Or they will find the right E Ink device with a front-lit screen that does not glare at them, and, yes, E Ink phones are on the way. The clubs could help educate readers of all ages about the possibilities, especially people with print-related impairments such as vision problems or dyslexia. The ability of e-books to do text to speech with the right software, not just reproduce oral narration from humans while simultaneously showing the related sentences, would be yet another advantage of smartly used e-book technology. Furthermore, consider the flaws of many studies critical of e-books. In measuring the value of paper vs. digital for reading, to give one example, researchers may try e-books on subjects who do not normally rely on them and who lack familiarity with the navigational capabilities of the best e-reading software—assuming it’s used in the first place. Navigation-related features can go far beyond a progress-indicator at the top or bottom or off to the side. Are you reading a long Victorian novel? Having trouble keeping up with the characters and their names? A state-of-the-art e-book device or app will not just show you the words surrounding the names as they appear in various locations within a book. It will also display virtual page numbers or the percentage of the text associated with the locations, and for me, this is infinitely more useful than just flipping through pages based on rough estimates of the physical locations of references within books. In matters of e-book literacy, I am self-taught. But imagine teachers and librarians caring about these issues and making certain students are truly availing themselves of the tools available. Hit-and-run experiments just cannot do justice to the full possibilities of e-books. What’s more, whether testing with books or shorter-length texts, researchers may not fully factor in presentational and ergonomic considerations discussed earlier, from font size to margin widths. Especially beware of research done with, say, a 14-point font in PDF at 100 percent scale on a 15-inch screen. That might be optimal for some e-reading subjects but not for all, including me. Instead of a primitive one-size-fits-all PDF setup, a truly up-to-date experiment would rely on the reflowable ePub format or an equivalent, letting you adjust the size of the words without having to scroll from side to side. The experimenters would even permit the e-reading subjects to choose the application (my own favorite of the moment is Moon+ Pro—e-Pub-capable Android phone and tablet software for books without Digital Rights Management). Let’s look ahead to the future when ePub and the like will count even more than they do now, and when more users are truly e-book literature. Other factors exist in helping the subjects achieve an optimal e-book experiment rather than a lab-rate-level one. Would a person fare better with an LCD screen, for example, or an E Ink machine? Or maybe both, depending on the book? And how good is the resolution of the display, and what’s the screen refresh rate? And is it possible that the subject might read faster and better off a tablet or even phone than off a desktop monitor? In laboratory tests by researcher not fully familiar with e-book usage, everything may be the same for all subjects. But in real life, e-book devices and applications should be like eyeglasses and hearing aids—selected with individual in mind, as opposed to a one-size-fits-all approach. More importantly, the issue is not just giving people the most optimal presentation of books and other items—it is also the number of suitable titles for individual readers, in the spirit of Ranganathan’s Five Laws of Library Science. With only about $4 per capita now going for content, the economies of a digital approach could offer a far, far greater selection. And via improved WiFi availability and otherwise, we could make digital library books more accessible than now for students and others in high-poverty neighborhoods and remote rural areas—“book deserts,” as some call them. Both well-off and not-so-well-off students would come out ahead with more of a digital approach. Easier sharing of content resources across America’s 3.8 million square miles would help. So would better access to books, including at home, where so many students have more time to absorb them. What, however, about access to the libraries themselves? UCLA researchers surveyed teachers about conditions shortening “learning time,” and even in low-poverty schools, about 25 percent complained of “insufficient access” to their school libraries. For higher-poverty schools, as defined by the number of students receiving free or reduced-price lunches, the figure was 35 percent. Warren Buffett might care to know that a recent Los Angeles Times article mentioned how some students would not be able to visit their school library to check out his biography. The library was closed for want of sufficient money for staffing. With an e-book and enough copies of it available, students could read about Buffett 24/7, and library staffers could focus more on being guides and mentors and less on the clerical aspects of their jobs, thus giving the taxpayers more for their money. In organizational terms, how could the endowment address those needs and others? The best approach would be for it to help establish and fund two national digital library systems. One would be for the general public and K-12 students. The other would be for the academic community. The endowment could also work with the Institute of Museum and Library Services to fund local and state systems directly. The public and academic systems could share a common catalog for interested users, as well as an infrastructure organization and some board members, along with many gigs of common content. Let both systems be accessible to all Americans and—at least when the economics allow, such with public domain works—to people everywhere. But separate the systems should be; for the priorities of public and academic libraries differ starkly. Public and school libraries focus primarily on the spread of knowledge to citizens of all economic levels. They are service organizations and exist at the mercy of taxpayers, whose needs and wants they must meet. While certain public library systems like those in New York and Boston are also major research libraries, their major mission is to serve society as a whole. By contrast, university libraries provide knowledge in much more depth, especially for the creation of more knowledge. They care less about packaging it for the masses than do public libraries, especially the Main Street variety. Many public library catalogs can be hard to use, but they are nothing compared to the complexities of the academic variety. The worthy but misnamed Digital Public of America, originated at Harvard, is an extraordinarily valuable academic library and archive (even if its contents are limited in important respects and even if it is far richer in links than in items stored on its own servers). But it is also a good example of the perils of confusing the missions of public and school libraries with the academic and other research varieties. Go the DPLA Web site at dp.la. The homepage has a museum-like look to it, and the interface is too complicated. Just how much appeal is there for typical K-12 students and other public library patrons? Granted, with its links to numerous collections elsewhere, including local and state libraries that it has encouraged to digitize historical items, the DPLA can expose K-12 students to a rich trove of source materials useful in research for term papers and the like. I applaud the move away from overreliance on textbooks. Let the DPLA thrive with endowment money! But by Readicide standards, the DPLA is a major disappointment and cannot substitute for a public library system online. Where are the popular children’s books and young adult titles needed to excite students? And how many current K-12 librarians or public school educators are among the DPLA’s top leaders? Furthermore, at DPLA meetings, people talk far more about metadata than about the reading and digital divides. Those are just a few of the reasons why the DPLA is not a genuine “public” library system even though it should share content with the real McCoys. Let us create a full-fledged public library system online, with the efficiencies of a national collection (individual libraries could still buy books and other items on their own). One way to kick-start the public and academic digital systems might be for the endowment to purchase OverDrive, the biggest library e-book supplier, while relying on its acquisitions side for help in dealing with major publishers and while improving its electronic distribution system. With endowment money behind it, OverDrive’s task would be easier, since libraries are now such a small part of the book market as a whole. More buying power would enable OverDrive and librarians to negotiate more favorable deals with major publishers than they can now, and the latter would still come out ahead, due to increased volume. OverDrive, meanwhile, has been one of the most effective promoters of e-books, complete with a “DIGITALbookmobile,” where library patrons can befriend the technology. Rather than wiping out OverDrive’s promotional efforts, libraries could build on them. At the same time, let’s not turn OverDrive into our national digital librarians. In the end library, K-12 and civic values must prevail over OverDrive’s corporate ones. So much for the benefits of the endowment and the essential twin-system architecture and a possible purchase of OverDrive. But why this particular means of raising revenue and creating a stream of it? Alas, differences can exist between the professed enthusiasm of Americans for libraries and their support in actual tax dollars, as shown by the low spending per capita on library content. Do not blame this on the Koch Brothers or other government haters. Again and again at election time, even without special interest money interfering, Americans have reelected politicians unwilling to give libraries the support they need. Especially do not count on stepped-up spending on libraries at the federal level. The Republicans control both houses of Congress, and House Budget Committee Chair Paul Ryan has even called for the defunding of the Institute of Museum and Library Services. Demographic changes in time will probably balance out the widespread gerrymandering of congressional districts that has helped anti-tax Republicans; but no immediate miracles are on the way. What’s more, suppose that even with nonHispanic whites eventually being a minority, voters and public officials are still less than fully cognizant of complex library and K-12 needs. Sadly the two African-Americans on the seven-member Alexandria City Council went along with the latest reductions in spending on public library books even though the local NAACP took a strong stand against the cuts. Beyond the basic issue of funding from politicians, another obstacle looms. Some librarians—far from all!—actually see increased spending on content as a threat to them. They fear it will come out of their future salaries, regardless of the existence of an endowment that would take up so much of the burden. “Take it as an assumption that the money will not increase,” a participant in a library forum online told me. “Where will you cut?” To make their case, librarians can appear before city or county councils in person at budget time. Books themselves lack the same number of defenders in these circumstances. That could be a major reason why just 12 percent of public library spending in the U.S. is for books and other content. The endowment-supported activities and the efficiencies of digital technology—reducing costs in areas ranging from physical storage to the operation of the checkout counter—could drive up this percentage and actually free up more time for librarians to interact meaningfully with patrons. And endowment could also help finance the revamping of library school curricula so that future librarians were more adept not just in technological matters but also content-related ones. Needless to say, as noted earlier, it also could help pay for more school librarians and others. All of those activities would be ongoing expenses, still another reason for thinking in about an endowment and an eternal stream of revenue. Unfortunately, as I’ve noted in commentary in The Chronicle of Philanthropy, the old Carnegian business models for libraries are obsolete. Carnegie wanted localities to pay for upkeep plus other ongoing needs of libraries. But in an era of parsimony run amok, this model for now will not work in its purest form on the very most massive scale at the national level even though it would be wonderful if endowment-improved libraries created the demand for more tax support of national digital library systems. Keep in mind Paul Ryan’s hostility toward the Institute Museum and Library Services and even the Obama administration’s less than fully enthusiastic support of IMLS. In related vein, yes, many philanthropists yearn to see their names on buildings—one reason for many library advocates thinking in the original Carnegian terms. But in a digital age, we could recognize donors through other means. How about, for example, “The Bill and Melinda Gates Collection of Computer Science,” words that could appear in a tasteful way in digital catalogs and in individual books? The Gates Foundation has paid for Net-connected computers and training at many a public library, but these days, at least, libraries rank low as a foundation priority. Just tens of millions of dollars each year go to public libraries, a minuscule amount of several billion the foundation disburses annually. Even worse, the foundation is phasing out its global libraries program. It apparently would rather focus on other areas such as health and economic development. At the same time I won’t give up on Bill Gates. The creation of an endowment helping to level the playing field would go nicely with his belief that “High levels of inequality are a problem—messing up economic incentives, tilting democracies in favor of powerful interests, and undercutting the ideal that all people are created equal.” In critiquing the work of Thomas Piketty, author of Capital in the Twenty-First Century, which warns of the perils of too much inherited wealth, Gates argued that Piketty “doesn’t adequately differentiate among different kinds of capital with different social utility.” Gates gave three examples: a man building a business, a woman donating most of her fortune to charity, and a big spendthrift who “is mostly consuming, spending a lot of money on things like a yacht and plane.” The first two uses of capital, he said, deliver “far more value to society than the third.” Strategically deployed capital at the national level, with ample input from many beyond the foundation world, could further increase the value of the kind in the second example. This is not to deny the worthiness of well-executed philanthropic initiatives by individual billionaires and their foundations, especially experimentation that can eventually be replicated by others, including government agencies, on a grander scale. We need both approaches. I’d hope Bill Gates would agree and fully appreciate the potential of a national digital library endowment as a promoter of both equality and wealth creation. Gates could stick to his current philanthropic passions but still team up with others to start the predecessor of public endowment without committing as much time and money as he would on his own. Ideally the academic research cited here will help inspire actual action from Gates, other philanthropists, and policymakers. Gates thinks of himself as science-driven; and Warren Buffett, Gates’ long-time friend, as well as a donor to the Gates Foundation, is a numbers man. Barack Obama and people in his administration are fond of terms like “evidence-based,” a Google search on which produces more than 6,000 results from whitehouse.gov. In this essay I have tried to oblige with mentions of statistically rich studies, as well as to guide philanthropists and policymakers to Readicide, which blends academic citations with first-hand experiences from a veteran teacher highly respected in his profession. Bill Gates and Warren Buffett are just two members of the Forbes 400 list. Hello, Larry Ellison and others? And how about billionaires with less liberal beliefs? Granted, many conservative Republicans billionaires would shun a White House-encouraged initiative simply because they opposed anything that made Presidential Obama look good. But more astute, less ideological ones ideally would see the possibilities here, and perhaps some GOP politicians would as well, including maybe Jeb Bush, the possible Presidential candidate whose mother and sister-in-law have both been staunch advocates of family literacy. The endowment could start out entirely or almost entirely with private donations and have virtually zero impact on the federal deficit. Besides, improved libraries could better serve private and charter schools as well as the usual public schools. Even some libertarians might be supportive in all senses of the word. More than any other government institutions, libraries provide self-empowerment for individuals, even when they are at odds with the government. This issue needs to transcend ideology. Encouragingly, none other than the late William F. Buckley, Jr., my political opposite, wrote two “On the Right” columns in favor of a well-stocked national digital library system. Referring to the then-name of my plan, Buckley said: “Andrew Carnegie, if he were alive, would probably buy TeleRead from Mr. Rothman for $1, develop the whole idea at his own expense, and then make a gift of it to the American people” (the real-life price, of course, is $0). Now look beyond one rich donor and think of the combined charity of a group of them, focused on results, not ideology. So here’s the message to Bill Gates, Warren Buffett, and the rest of the Forbes 400, whatever their political and economic beliefs. If you want to leave a lasting legacy as digital-era Carnegies, a national digital library endowment is an excellent way to do it. David H. Rothman, a former poverty beat reporter for the Lorain Journal in Ohio, has been advocating well-stocked national digital libraries since the early 1990s. He founded the TeleRead e-book site, runs the LibraryCity.org advocacy site, and has written on the digital library endowment concept for the Chronicle of Philanthropy and Library Journal. You can reach him at davidrothman@pobox.com. This CC-licensed post appeared originally on the LibraryCity site. Note: The BiblioTech library mentioned at the top of this commentary is simply there as an example of what the proposed endowment could help finance. It is not associated with me or the LibraryCity site.